At 25 metres, our Didsbury swimming pool is one of the largest in the outskirts of Manchester. Perfect for family fun time and serious swimmers. Our swimming lessons cover everyone – young and old – whether you are learning to swim or training for your first triathlon. Of course, if you are looking to get fit, our Didsbury pool has plenty of room to take advantage of this. You can use our popular SwimTag, which records, tracks, and then uploads your performance, to help you to swim farther and faster over time. Of course, the pool can also be a relaxing place. So don’t forget to enjoy our sauna, steam room and poolside Jacuzzi. 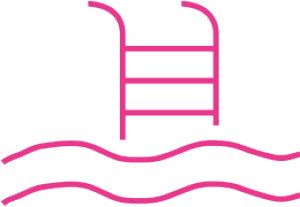 Looking for Manchester swimming pools? Then Waterside has everything you need, right in the heart of Didsbury. Perfect for fitness there’s SwimTag for improved performance and a regular schedule of Aqua Aerobics. Of course, if you’re not feeling energetic, our 25 metre Didsbury pool also has plenty of space for relaxing, fun and family swim time. Rejuvenate mind and body in the warmth of our sauna, designed to soothe weary muscles and give skin a healthy glow. Then detox and relax in our steam room. Finally immerse yourself in our poolside Jacuzzi and emerge reinvigorated, refreshed and ready to face the world. It’s the perfect way to end a workout – or simply end a day. “I really enjoy the refurbished Waterside gym. The new weights area feels more open and accessible. The new sauna is a great acquisition.